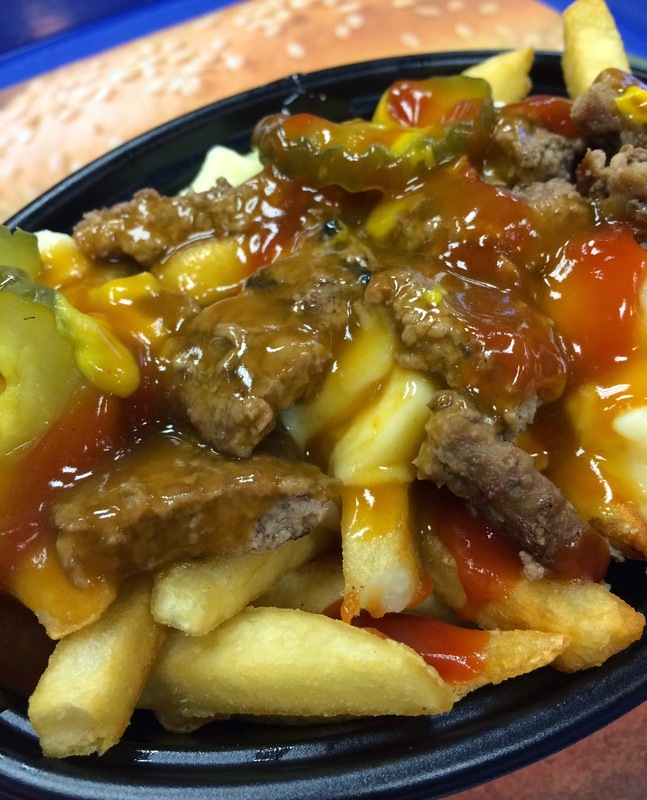 My husband found that Burger King in Canada sells "Poutine À La Burger" for a limited time, and it's one of the must poutines I was going to get. 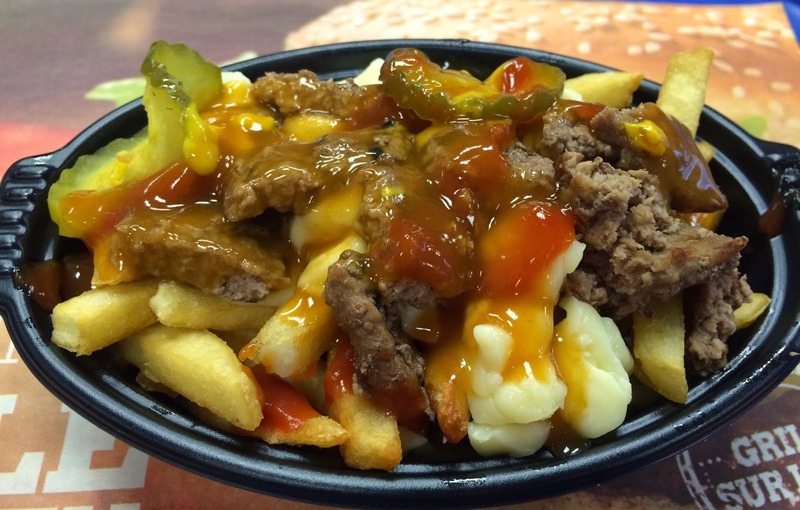 The name says it all, and it's made with fries, cheese curds, gravy sauce, chopped beef, mustard, ketchup and pickles. 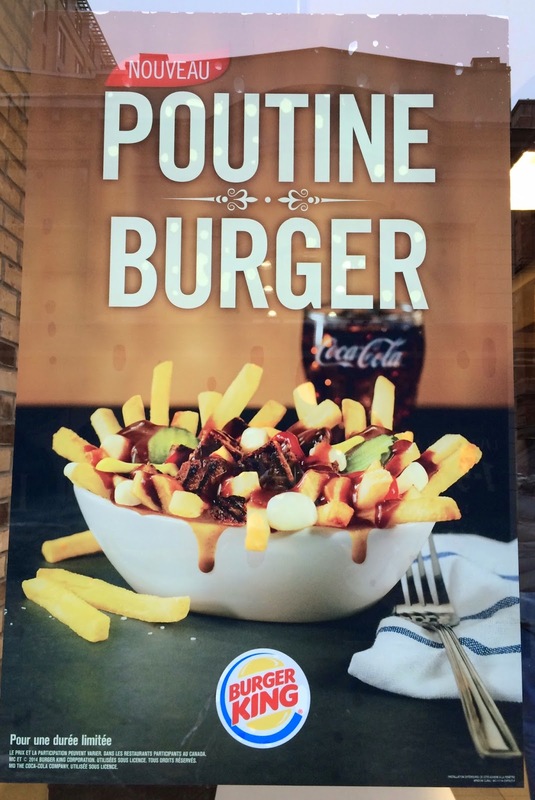 So technically, it's a Whopper without bread, mayo, lettuce, tomatoes and onions but with poutine. After their breakfast menu time, I went to a branch and tried it. I couldn't find the launching date but many articles regarding this hybrid food on November 12, 2014. 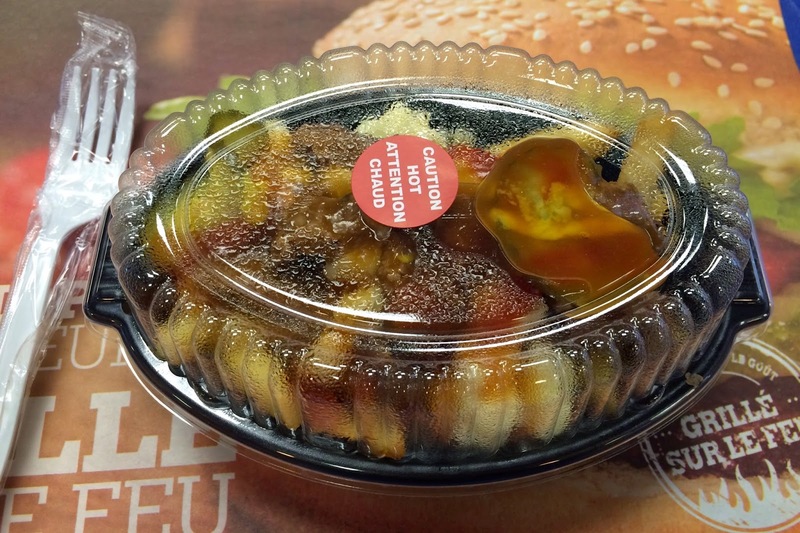 It's labeled "Caution Hot / Atention Chaud." I smelled strong sour scent which could be either mustard or pickles, or even both. I knew there'd be those ingredients used in Whopper but I didn't know they'd large pieces of char grilled beef patty chunks, 2 wavy slices of pickles, which were same size used in Whopper, and generous amount of ketchup and mustard. The beef was juicy and not dried at all even though they're cut in pieces. Fries were thick and cheese curds didn't have much chewiness. Gravy sauce was slightly sweet and had no bitter flavor. 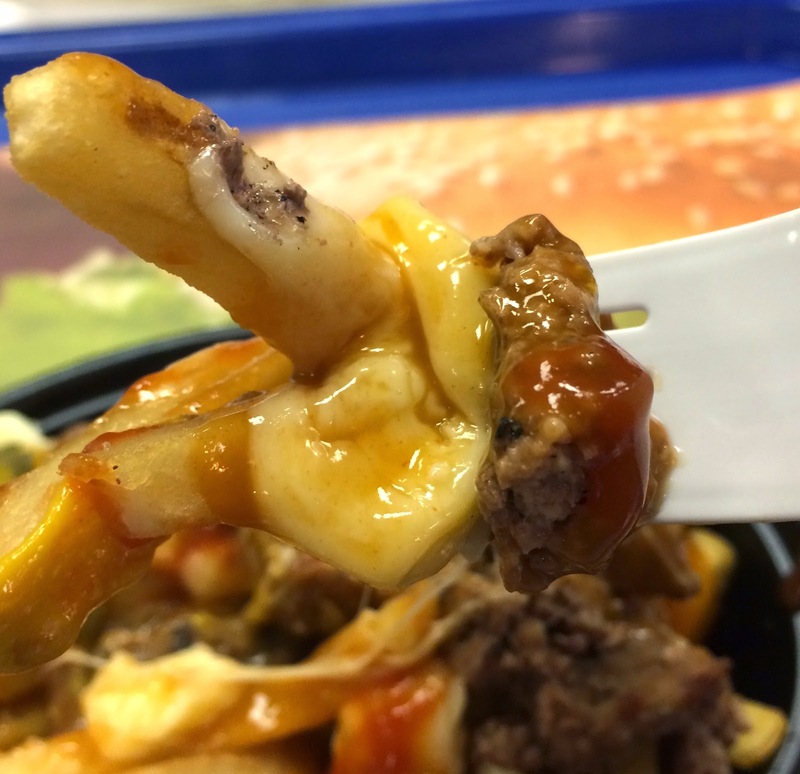 However, the amount of mustard used in this poutine was way too much for me because I'm not a fan of mustard. 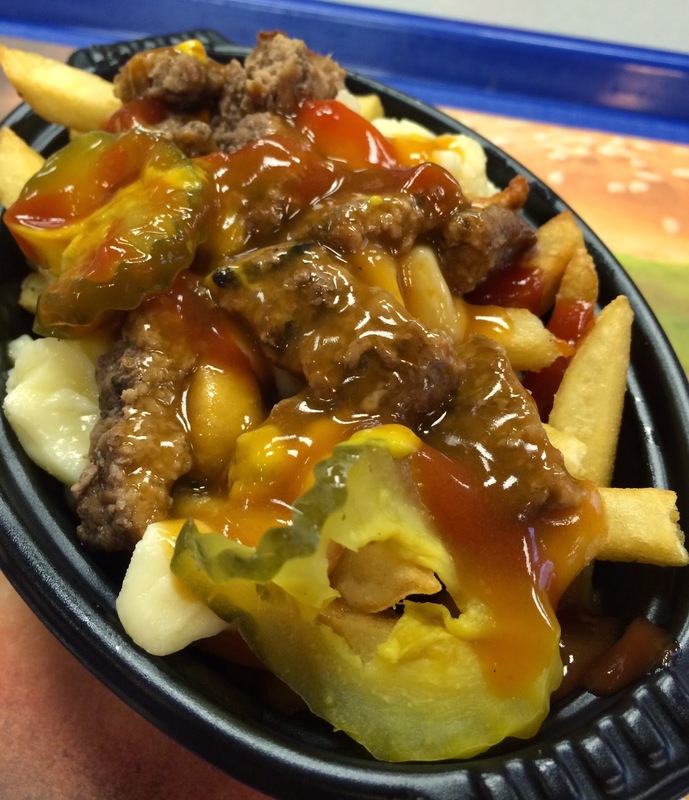 The mustard made this poutine weirdly vinegary. Ketchup was sweet and sour, but still mustard was much stronger. Little by little, I got used to the yellow mustard flavor, but I didn't think it's tasty and only ate the half of this. Personally, I think it could have been tastier if they hand't put any mustard.